The Rosenheim poltergeist case study! 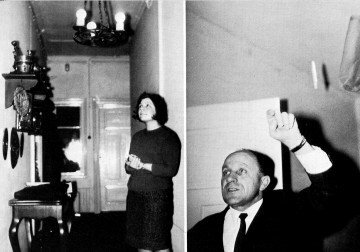 The alleged Rosenheim poltergeist hauntings took place in the offices of lawyer Sigmund Adam in 1967. Alarming phenomena suddenly started in the offices - the lights would turn themselves off and on and swing violently, telephones rang (without anyone on the other end of the phone), copier fluid spilled out of photocopiers and desk drawers appeared to open by themselves. The Deutshce Post also installed instruments to monitor outgoing phone calls and within five weeks around 600 calls to the speaking clock - number 0119 in Germany - had been made, with no-one confessing to making them. Even when all the office phones were disabled, with only Sigmund Adam having access the calls continued. In one 15 minute period the speaking clock had been called an amazing 46 times. Paintings and heavy furniture even began swapping positions by themselves and then in October of that year all the light bulbs in the offices blew simultaneously. After technicians from Siemens and Elektrizitatswerk (the Germany electricity board) couldn't find any faults, a team of paranormal investigators began investigating the case. Parapsychologist Hans Bender discovered that the phenomena seemed to center around a 19 year old, recently employed secretary called Anne-Marie Schneider. Hans was able to document on video how the lights immediately began to flicker as soon as she entered the offices. In December of '67 and January '68 the phenomena expanded. Calender pages flew off the wall, paintings were thrown across the room and perhaps most shocking of all, a 400lb cabinet was seen sliding several feet across the floor, with no damage made to the linoleum flooring. Anne-Marie left the company in the middle of January 1968 and the phenomena at the offices stopped. The last known thing heard about Anne-Marie is that in 1969 she married and the activity stopped completely. There are many people who believe that entire thing was hoaxed by Schneider or Sigmund Adam for the publicity, but the thing that makes the case so compelling is the amount of documentation done on it, by many different people and none of them could pinpoint the root cause.